Here I write about my second day of the gamejam weekend. Part 1 is here. On the second day of the gamejam, I had a scheduling mishap. I had convinced myself that I had band practice and took some notes for the game in the morning. After I went into town and learned of my mistake I decided to use it as an opportunity for learning. 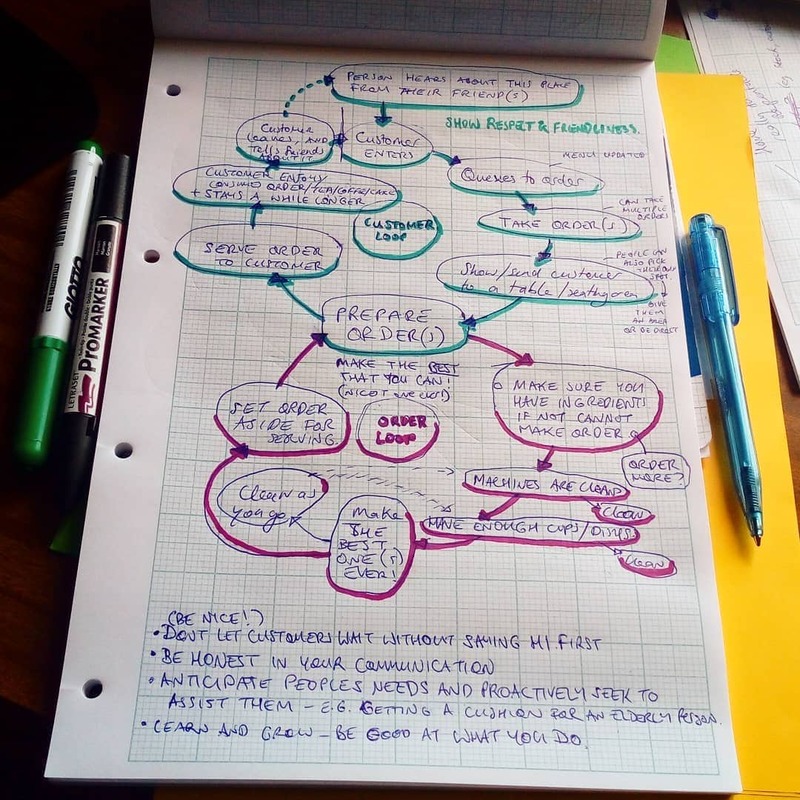 Knowing practically nothing about how a café or tea room actually works I reckoned it would be a good first step to organize a short meeting with some people who run such a business. My research hat on, I set out for a place that serves tea and has a relaxing atmosphere – The Secret Garden. It is a lovely spot for a cup of tea. Coming across a place like The Secret Garden in the post-apocalypse would be a welcome respite from harsh realities of survival. What about The Secret Garden gives it that feeling of calmness, relaxation, of care? Before my conversation I never gave this much thought, it just seemed homely and that maybe it is a part of the personality of the owners. Of course, I was wrong, everything about it is considered. Now, it is a bit odd for a customer walking into a business to ask all about it. I did not expect to be able to get anything that day. Thinking that it may be possible to set up a little 10-minute meeting at some point in the next week or two I went and asked. As it turns out they were very accommodating! They were busy enough in the cafe, so I felt I was kind of intruding. The manager was still happy to drop in with me between customers to continue our conversation and answer my questions. 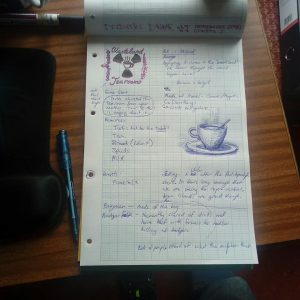 I wrote down as much as I could and those notes will serve as a guide for the Wasteland Tearooms, or whichever nice tearoom/café I write into a game. From the fact that they even talked to me I learned two important lessons. How much they care about their customers and how running a café demands all of your attention all of the time. The Secret Garden owners and management have been working towards and maintaining that relaxing feeling since it began business. It’s what people are looking for when they go there. There is no Wi-Fi. It’s a place to disconnect from distractions in life and focus a little on connecting with a friend, friends, or yourself. 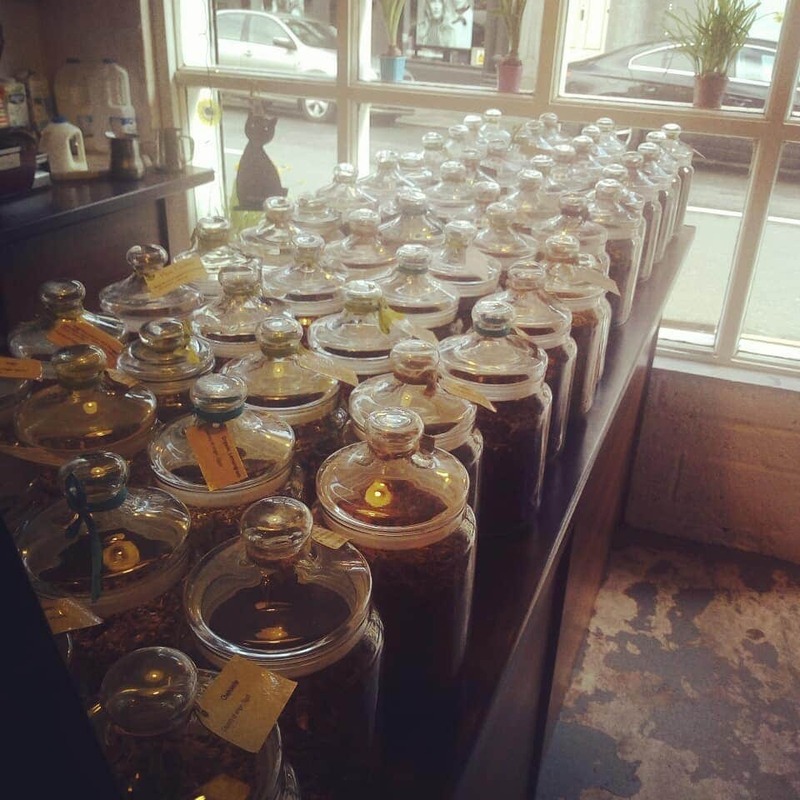 The folks who run The Secret Garden are deeply interested in tea and herbal infusions. The owner and manager had travelled halfway across the world in the previous year, learning about different teas and tea ceremonies first hand. They have brought back their experiences to the business and now run their own tea ceremonies with small groups. Their passion permeates their shop, and you can easily sense it. The previous night I had worked a little on the main loop for the game. I guess once I make a few games it will be much more clear what I should be aiming for. After my tiny research expedition to The Secret Garden, I decided I needed to throw most of that ‘core loop’ idea in the bin. That first core loop sketch wasn’t considering the pressures of running a shop – something I think would be important to get across in some kind of game mechanic. 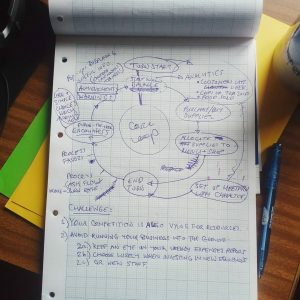 The revised core loop is more like a flow chart for running a shop than a map of a game’s core loop. However, it is another iteration, something to work from or cast aside as I get closer to the game. In the creative process of prototyping for this game jam, I generated some very valuable things – insights and an interesting setting. However, I did not give myself enough time to actually make the odd interactive-fiction turn-based-strategy Twine game I had set out to make at the start. I will certainly be working more on a Post-Apocalyptic Ireland game or series of games. A CRPG with characters, companions and a rich backstory is what I would be most excited about, but I do not have the resources to pursue such a largely scoped game. Maybe I could manage a short questline by modding an existing RPG like Pillars of Eternity II: Deadfire or Divinity: Origin Sin 2. Whether any of those is about a Wasteland Tearoom or some other aspect of the setting only time will tell. I will certainly aim to finish off that silly Twine game first – if only to let the idea percolate in reality for a while. Ha, I thought it’d be fun to leaf you with a pun. 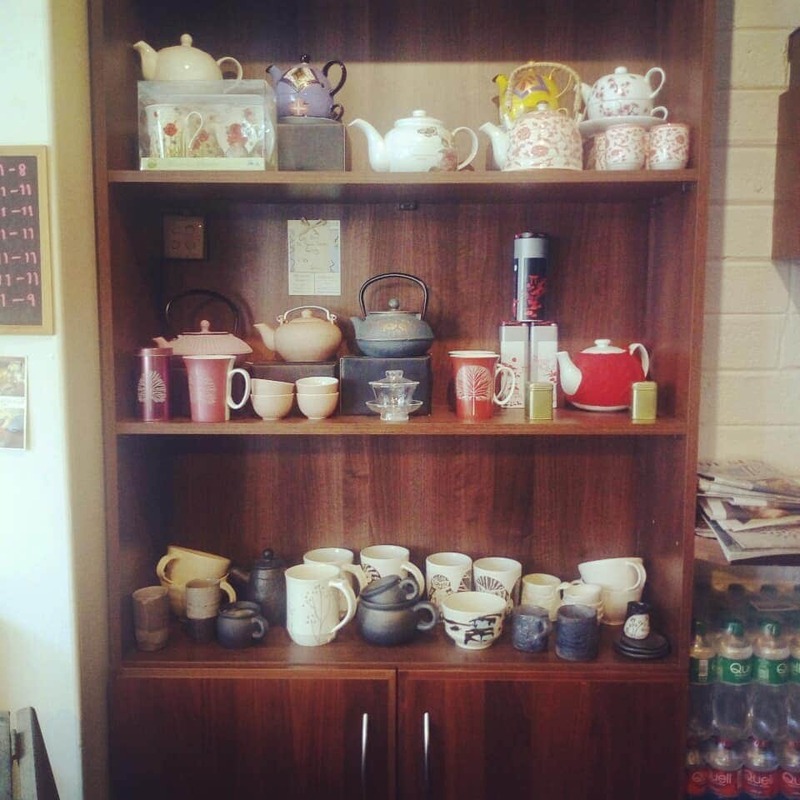 The Secret Garden has a vast variety of teas to choose from, right at the moment you enter the premises. The revised core loop design. A cabinet of lovely teapots and cups in the Secret Garden.